Fall marks the time when Vermont’s snakes may travel long distances to return to their den sites for the winter. The Vt. Fish & Wildlife Department is asking people to keep an eye out for snakes while driving, both to avoid running them over and also to report any snake they see out and about. These sightings will help to document the distribution of different snake species in Vermont. According to Jim Andrews, coordinator of the Vermont Reptile and Amphibian Atlas, roads can be great places to find snakes in the fall, but they can also be deadly for the reptiles. Wildlife biologist Doug Blodgett works to conserve snakes for the department. According to Blodgett, snakes provide important services to people like eating disease-carrying rodents and garden pests. 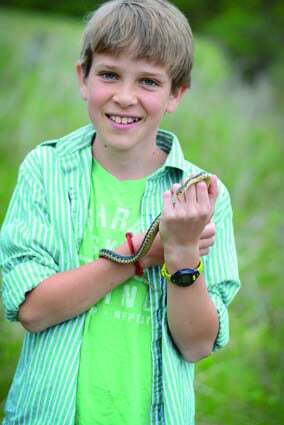 He believes that while some people may fear snakes, the creatures are too often misunderstood. Blodgett and Andrews are asking the public to help efforts to conserve snakes by submitting sightings that document where different species are found. Citizen reports will also be useful in indicating where important road crossings exist so that appropriate road crossing structures can be considered. These sightings might also raise early warning signs, for example, if species seem to be absent where they used to be common, or other trends that indicate when additional conservation action may be needed. To send a report, go to vtherpatlas.org, or email Andrews directly at jandrews@middlebury.edu. Vermont’s snakes are on the move in the fall, and conservationists are asking the public to submit photos to help document their distribution.